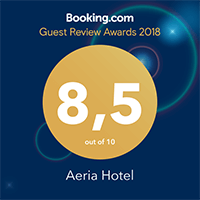 ‘HOTEL AERIA’ is 7km far from the vibrant, coastal village of Potos, and 10km from the small town of Limenaria. There are plenty of gift shops, handicraft shops, taverns, restaurants and exciting nightlife in both the village and the town. A picturesque town with its harbour dominated by the old castle. Kavala also offers an archaeological museum, a folk museum and an art gallery. One hour by ferry from the harbour at Prinos. Saint Paul’s first stop in Europe. The ancient theatre and the ruins of the town are an absolute must. It was classified as a UNESCO World Heritage Site in 2016. 20 minutes from Kavala. The riverside forest of the Nestos Delta is unique for the variety of species that grow, live and stop there. Whatever you do, don’t forget to walk the steep path which starts from Toxotes and heads towards Stavroupoli. Famous worldwide for its vast cave complex which was recently opened to the public. One of the largest, most beautiful, and most easily accessible caves in Europe. One hour from Kavala. Thassos offers endless opportunities for all kinds of excursions, ensuring that you will never run out of things to see and do during your stay here. Thassos has something for everybody. Go and hike its mountain paths, explore its villages, discover its beaches by boat, hit the trail in a hired jeep, or take a day trip to one of the countless attractions in the surrounding area. The island’s mountain villages are a great way to escape the heat of the midday sun. Have a reviving drink at one of the cafes or tavernas on the village square in the shade of the plane, mulberry and walnut trees. Aliki is one of the most beautiful sites in Greece, combining pine forests, the white marble of the ancient quarries shaped and polished by the wind, the blue crystal waters of the Aegean, the ancient ruins and the traditional village. It really is a dream location. The sea is clean, the fish abundant, and the sand a marble white. Children will love its two small, yet incredibly picturesque beaches, while the more adventurous can dive from the smooth rocks into a crystal sea. The best place to start a tour of Aliki is the east beach. At the right-hand end you will see the ruins of an ancient temple dating from the 7th Century BC extending almost into the surf. Following the path we come at last to the centre of the ancient quarries at the westernmost end of the little peninsula: marble columns, square-cut stones ready for shipping and visible everywhere the signs of mining and digging. We return on the opposite side, following the steep path and arriving at last at the west beach, where we can revive ourselves with a refreshing swim, an ouzo or a cup of coffee at the water’s edge. Limenas. The ancient capital of the island, and now capital again in modern times. Nature endowed it with a safe harbour, making the town the main centre of communications with the outside world at the closest point to the mainland across the water. A vast pine forest blankets the surrounding hills. Its two harbours (three when the new marina is complete) dominate the waterfront. Every free space is scattered with the relics of the island’s glorious past. Ancient temples, the ancient theatre, the defensive walls, the acropolis, the Vriokastro area, the ancient agora and much more besides. With the end of piracy and the absorption of hundreds of refugees, the old town, once forgotten by the passage of time, experienced enormous growth and is now seeking to reclaim its former glory. Vriokastro, with the sanctuary of the Saints Apostles built on its ruins. At the top of the hill beside the wall is the ancient theatre hidden in the forest above the two harbours. Continuing through the greenery we come to the acropolis, where we can stop to admire the view and see the sanctuaries of Apollo, Athena and Pan. Descending the path now, we trace the line of the ancient walls and admire the stone doorways. Back on the road, we see on the right the sanctuary of Hercules and the Arch of Caracalla (the Roman Emperor Marcus Aurelius Antoninus). From here, and returning to the old harbour where we started our tour, we see the ruins of temple of Dionysus and of the ancient agora. A good guidebook will give you much more information than we can provide here. Together with Alyki, the ancient town of Limenas reawakens the memories of the island’s ancient history. on the coast road towards Alyki. This convent, a dependent of the Monastery of Philotheos on Mount Athos, is built on the brink of the cliffs overlooking the sea and is well worth a short visit. B. Panagias, the Monastery of the Virgin Mary on the road to Maries. Inhabited by just one or two monks. C. Ayiou Panteleimonos, the Monastery of St. Panteleimon, in the interior of the island, which can be reached most quickly from Kazaviti, but also from Maries. The road is fairly good and leads you up to the highest peak on the island. The view from the top of the entire island laid out before you make the journey well worthwhile. This trip can be combined with a visit to Theologos, Kastro, Maries or Kazaviti. Why not go for a ride on the horses of the Thassos Riding Club. You can take riding lessons with trained tutors or even go trekking in the mountains. The spectacular island of Thassos is a popular tourist attraction, hence its transportation links are excellent. The island has two ports, the main is in Limenas (Thassos) the capital of the island. The way to Limenas from Keramoti towards the mainland is the most popular one to reach Thassos. There are very frequent itineraries, every thirty minutes, from early in the morning until late at night. “HOTEL AERIA” is only 35km far from the port of Limenas. Follow the map in order to see the route. Charter flights are the most popular way to arrive at the island of Thassos from most European countries. Especially in high season (April-October), there are several flights from many European areas to Megas Alexandros Airport in Keramoti.